Remodeling any room in your home can turn into a nightmare if you don’t choose the right contractor. Our goal is to make your bathroom renovation as painless as possible for everyone involved. No project is too big or too small for our experienced team. 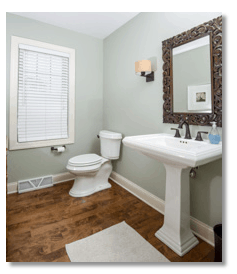 We enjoy the challenges and victories involved in the bathroom remodeling process. The bathroom is one of the most visited rooms in the home; it must meet the needs of people of all ages. It’s often the first room we visit in the morning, and the last room we visit at night. It must be well-designed and well-built to meet your family’s specific needs. Every bathroom remodeling project is different, because every family’s needs are different. We understand that the decision to remodel any room, especially your bathroom is a big one. You are the only person who truly understands exactly what you envision for your newly remodeled bathroom. Our goal is to create the bathroom of your dreams based on the information you provide along the way. You will be included in every decision during the bathroom renovation process so that there are no surprises at the completion of the project. Our experienced team of bathroom remodeling specialists understands that your bathroom must be completed in a timely manner with minimal disruption to your home life, and on budget. 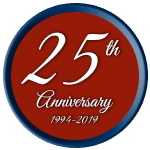 If you are looking for bathroom remodeling in Brookfield, Pewaukee, Sussex, Delafield, or Waukesha County — We’d be happy to have the opportunity to work with you! Call us today to schedule an in-home consultation on your bathroom remodel ideas. 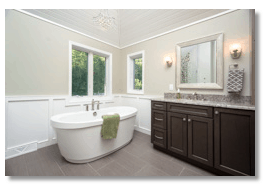 We are your bathroom remodeling contractors of choice!